Driving under the influence is taken very seriously in Maryland, and DUI penalties reflect that. If you’ve been charged with DUI, you need strong defense representation to help you avoid fines, jail time, and severe driving restrictions. Drivers arrested for DUI in Maryland face immediate administrative sanctions, as well as additional criminal penalties and license sanctions if you are convicted of a DUI offense. In 2016, Maryland further increased DUI penalties and expanded the Ignition Interlock Program, which strictly monitors DUI offenders behind the wheel. When you consider the range of serious, life-affecting consequences associated with a DUI conviction, the need for strong DUI defense representation is clear. 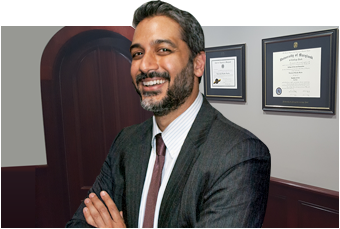 At The Law Office of Hammad S. Matin, P.A., our La Plata & Waldorf DUI lawyers goal in every DUI case is to save our client’s driver’s license and obtain a “not guilty” verdict at trial, a dismissal prior to trial, or a reduction to a lesser charge. When you are arrested for DUI, the penalties start coming down almost immediately. To keep your driving privileges and protect your rights in the days and months to come, it’s critical to hire an experienced DUI defense lawyer. If you are stopped by a police officer and are suspected to be under the influence, the law enforcement officer may request that you submit to a field sobriety test or portable breath test. If you are then arrested for DUI, the police officer is required to advise you of your rights and provide you with an “Advice of Rights” form before requesting that you submit to a chemical blood alcohol concentration (BAC) test. If you test above the legal limit for alcohol—0.08 BAC—or refuse the officer’s request to submit to a chemical test for alcohol or drug use, you will be issued an Order of Suspension suspending your driver’s license, along with your traffic citation(s). The officer will confiscate your Maryland driver’s license and may issue you a 45-day temporary paper license. For a first DUI offense, you face up to a $1,000 fine and up to one year in jail. Your driver’s license may be revoked for up to six months, and you’ll receive 12 points on your driving record. For a second DUI offense, you face a $2,000 fine and up to two years imprisonment with a mandatory minimum of five days. Your driver’s license may be revoked for up to one year, and you’ll receive 12 points on your license. For two DUI convictions within five years, a mandatory period of suspension will be followed by a minimum required period of participation in the Ignition Interlock Program. Lawyers from The Law Office of Hammad S. Matin, P.A. defend DUI charges in administrative hearings, district courts, and circuit courts in Charles County and throughout southern Maryland. We have an overwhelming success rate when it comes to helping our clients avoid DUI penalties, including driver’s license suspension, ignition interlock devices, fines, and jail time, which, in turn, means your life can move forward without the burden or stigma of a DUI conviction on your permanent record. A DUI can be beaten with experienced defense representation. Contact the Law Office of Hammad S. Matin, P.A. right away if you have been charged with driving under the influence in Maryland. DUI penalties are among the most severe and far-ranging of criminal consequences. However, by hiring an experienced DUI defense lawyer, you can avoid some, if not all, of these penalties. If you or a loved one has been arrested for DUI in Charles County, please contact The Law Office of Hammad S. Matin, P.A. for a free initial consultation. Give our La Plata & Waldorf DUI penalties lawyers the opportunity to tell you how we can help, and take the first step toward putting this potentially life-derailing situation on the right track.